The band had been hanging out in Christiania a lot since they arrived in Denmark and really wanted to play a gig there and had been trying to find out how. 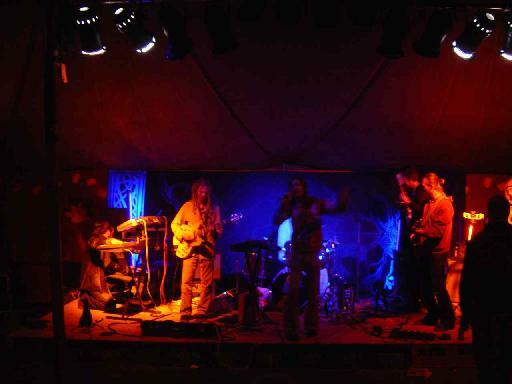 There are a few Finnish guys they know who live there (Sami) and it was arranged that they could play at the tent outside Woodstock, which was still set up from the day before when Christiania celebrated its 32nd birthday. A band was going to play at 10. We arrived with the PA (thanks to Mantric Muse!) and all their gear and set up in 45 minutes and they were playing around 8. A crowd of around 100 slowly built up as they played for like 70 minutes. This was a very intense show and the band had smoked a lot and many joints floated onto the stage throughout their playing and they gladly smoked them. They opened with "PH7" and "Steve". "Amos Ame" and "Njator" followed. They were really flying by now and "Kaneh Bosm" was awesome! The band was really in a special hypnotic groove and playing the best of any of the show. "Kaikados" was insane. They were allowed to play two more songs and I had hoped for "Gnomen". "I-Mantra" was super and then they finished with the very electronic "Gnomen" and the people who were there were pretty blown away, although a lot of the already wasted people that hangout at Woodstock probably don’t remember a thing! Ha! What a way to finish the tour!